So you have a vehicle that you love to push to the limit at the TRACK, but you also use the same vehicle to COMMUTE daily... You want a coilover to enhance your vehicle's handling performance at the track, but you fear that your daily commute and comfort will be sacrificed. No worries here, H&R's Coilovers broke away from traditional twin-tube shock absorbers and engineered a state-of-the-art mono-tube gas shock construction to bring you the best suspension product available for your 05+ Audi A3. Using top quality materials, H&R's engineers modified each coil over shock with a progressive rate spring to provide you with performance handling and a comfortable drive, all in one incredible design. H&R is the originator of the true coil over system for the street and continues to lead the market with an extensive line of applications. Each shock is tuned with a progressive rate spring that is engineered from its inception to work with the shock’s valving, creating a finely tuned suspension system. H&R Coilovers are the suspension answer for everybody, from daily drivers to the serious tuner. *12 Lowering height will vary on vehicles with factory sport suspensions such as BMW M-Technik, Mercedes-Benz Sport-line suspension, Audi-Sport suspension, etc. *26 When lowering the chassis more then 1.4", and your vehicle has a 42mm or larger drive shaft your must use one of H&R's Volkswagen front sway bars to accomplish adequate drive shaft clearance. Q - Will aftermarket coilovers void my warranty? A. A dealership cannot "void the warranty on the whole car" just because you have a CAI (Cold Air Intake) or aftermarket wheels. if they are trying to deny warranty service, they must prove that the mod caused the problem. Of course, adding a turbo kit (for example) can put a lot of stress on the engine itself, as well as to the drivetrain. Don't be surprised if the dealer refuses to perform warranty service on a heavily modified car, that's just common sense. THAT SAID, if your mod *did* cause the problem, then it's your problem and you have to deal with it. Q - What is a Coilover? A. A coilover suspension basically gives you a matched lowering spring and shock absorber combination with the added benefit of adjustable ride height and spring rates through a moveable spring perch or perches. Q - Why are Coilovers superior to a spring and shock combo? A. 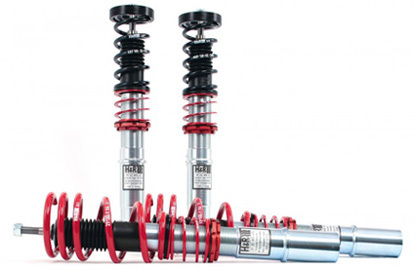 As stated above coilovers are a lowering spring and shock absorber combination, however instead of playing mix and match, the springs and shocks are designed, engineered, and developed to work in unison to provide the most optimal performance possible. Coupled with adjustable height perches, some coilover systems have the option of adjusting the damping level of the shock absorber offering even more fine tuning options over an individual spring and shock combination. Q - Will lowering my car with Coilovers cause my tire to rub? A. Given that the standard wheels and tires are used, there will be no tire-to-body rubbing. Lowering the vehicle simply relocates the wheels to a different travel point. However, when up sizing to bigger wheels and tires it is important to keep within the original overall outside diameter and width relative to wheel offset. That is, fitting larger diameter tires which dramatically increased overall diameter will probably lead to rubbing. As will increasing width excessively or using the wrong offset. Simplest rule of thumb is that if it rubs now when loaded, it will rub even more if you lower it but that's not the coilover's fault. Q - Will lowering my car with Coilovers cause my tires to prematurely wear? A. Yes, factory suspension settings are designed to have zero camber, allowing the whole contact patch of the tire to fully contact the road. Using an aftermarket coilover system, lowers the car, which in turn moves suspension arms off factory settings, giving your car negative camber. This will prematurely wear down the inside of the tires. This can be fixed however with the use of aftermarket adjustable camber arms, or if the coilover is equipped with adjustable camber plates. Q - Spring Rate, what it is and why is it important? A. A spring will be compressed when load is applied. The distance it is compressed for that given load is referred to as the spring rate. Spring rate is specified in terms of force applied per distance of compression. Typically, the units of spring rate are pounds force per Inch or using the metric Sl system - Newton's per millimeter. We can just as easily convert the pounds into kilograms and measure the deflection in millimeters. If a load of 1 kg deflects a spring 1-mm, each additional 1-kg will deflect it another mm. For each kg removed from the load the spring will return one mm toward its original state. The spring may be loaded at the rate of 1 kg per mm until it is compressed beyond its capacity. This means the spring will become damaged and will not resume its original characteristics when the load is removed. This point is called the elastic limit. A spring loaded beyond the elastic limit is deformed permanently. In this example using linear design coils, both springs have 125 kg's of force applied to them. The standard spring has compressed 150mm from its original height. 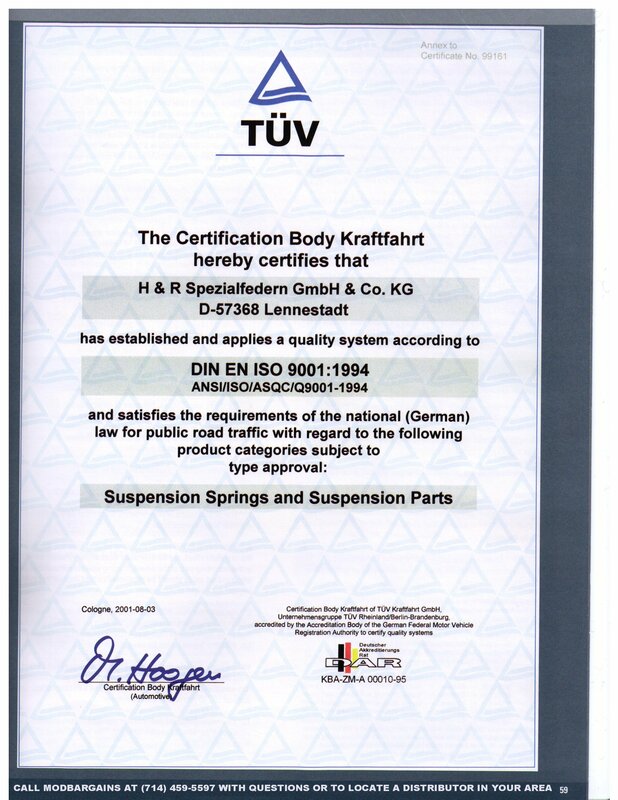 It therefore has a spring rate of 125 kg's per 150 mm, or 0.833 kg's/mm. The replacement coil however with the same force only deflects 100 mm. Its rate is therefore 125 kg's per 100 mm or, 1.25 kg's/mm. It is a heavier spring. Even though the replacement spring is 50 mm shorter, given the same weight, the ride height will be the same. However, because the spring is of a heavier rate, it will sag less, handle greater loads and often perform better in performance applications. A lowered heavier rate spring may be shorter again to deliver a lowered ride height with a heavier rate.